Weddington junior Alec Mock doesn’t necessarily stand out in a crowd. At 6-foot-3, 230 pounds, Mock possesses good, but not great size for a linebacker. However, he has a knack for being around the ball. 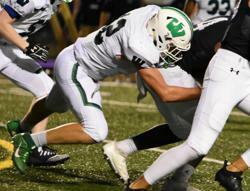 The leader of the Weddington defense made 146 tackles as a sophomore and followed that with a 157-stop season in 2018, a season in which Weddington captured their second state title in three years. Mock takes pride in his ability to play all over the field so this offseason, he’s worked on two skills that help him do that. Mock is a true middle linebacker in a time when most schools only play out of the nickel package. In order to consistently play the 4-3, a team has to have three athletic linebackers that can play in coverage and a MIKE linebacker that can read and diagnose plays. Not only can Mock do all of that but he also has the quickness to attack downhill and make plays in the running game. But while Mock feels most comfortable anchoring the defense from the middle of the field, that’s not the only position from which he can impact a game. Mock has played as an edge rusher, at the WILL and SAM linebacker spots and even occasionally as a down lineman. A workhorse that rarely comes off the field, Mock is the perfect leader of another staunch Weddington defense. Mock is the type of player that is never completely satisfied, always looking for ways to improve. That makes his explanation of his personal goals wholly unsurprising. Mock has been All-Conference in back-to-back seasons, but that hasn’t made him complacent. An under-the-radar college prospect, Mock has the opportunity to make a name for himself as a senior. Now, the offers are starting to roll in. After receiving a scholarship offer from the University of Miami (Ohio) early in the 2019 offseason, Mock picked up offers from Eastern Michigan, William & Mary and Columbia University in quick succession. Still, Mock is more concerned with letting his play on the field speak for itself. As he continues to show his consistency, expect the offers to continue to roll in over the next year.